Description Set trace header values using arbitrary calculations. This process creates a new volume with modified headers by executing a formula at each input trace, using one or more horizon values and/or header values from the input volume. For more information on operators, variables and math functions usable in the formula, see Functions and Variables for Math Expressions. This process will not allow you to alter the fundamental headers that define a volume (e.g. NS, DT, and DELRT for all volumes; INLINE and CROSSLINE for 3D volumes; EP and TRACR for shot/channel volumes; etc). NS, DT, and DELRT are modified only by using one of the processes designed to change the length or sampling of traces (such as Trace Pad, Trace Shift, Volume Resample, Velocity Conversion, etc). Depending on the situation, you may be able to change the other restricted headers with the Reassign Geometry Headers process. Other fundamental headers that cannot be modified inside Insight (such as INLINE/CROSSLINE for a 3D volume) can be changed during SEG-Y export, if necessary. Select Header Maths and type a name for the process. Select Input Horizons and its Properties by clicking on the Add icon on the right. 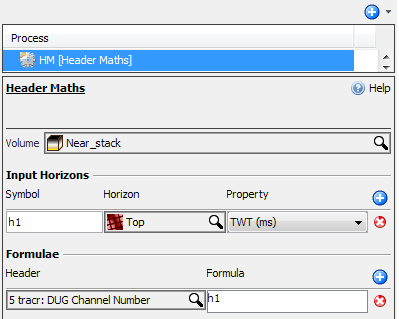 In the Formulae section, choose a Header and type the formula to execute. Scaled fields can be identified in the Trace Headers table below where the 'Scalar' column is defined. These fields will be scaled automatically when used as a variable in a Header Maths formula or when storing the result. That is, the real, human, floating-point value is what will be used in the formula, and what your formula should produce. Assuming that your receiver depth header is set correctly in the first place, this will give the correct result regardless of the value of SCALEL. DUG Insight uses SEG-Y rev 1 headers in its internal data format (see Trace Header Variables for Math Expressions). The table lists the purpose to which Insight puts those headers, assuming that the data was loaded from field tapes in Insight, and that the header values have not since been modified. If Insight does not use a header for any particular purpose, its SEG-Y rev 1 description is given.